"Alluvial" redirects here. For the American racehorse, see Alluvial (horse). For the type of flow diagram, see Alluvial diagram. 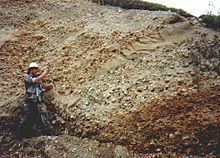 Most alluvium is geologically Quaternary in age, and is often referred to as "cover" because these sediments obscure the underlying bedrock. Most sedimentary material that fills a basin ("basin fill") that is not lithified is typically lumped together as "alluvial". Alluvium of Pliocene age occurs, for example, in parts of Idaho. Alluvium of late Miocene age occurs, for example, in the valley of the San Joaquin River, California. ^ Huber, N. King (1981). Amount and Timing of Late Cenozoic Uplift and Tilt of the Central Sierra Nevada, California—Evidence from the Upper San Joaquin River Basin (USGS Professional Paper 1197) (PDF). Washington D.C.: USGS. p. 13. 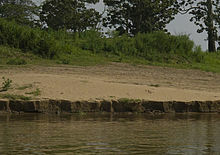 Wikimedia Commons has media related to Alluvium. Chisholm, Hugh, ed. (1911). "Alluvium" . Encyclopædia Britannica (11th ed.). Cambridge University Press.